Lateral thinking. Are there still any real innovations in smartphones? Samsung surprises the consumer with the Samsung Galaxy Edge and its curved screen that arches around the casing's front. In this report, we will find out whether this really has any impact on how the phone is used. At first, many thought of the edge display is a gimmick, but in reality, it’s more than just that. The edge panel gives users new ways to interact with the device, and to get work done in an easier, faster way. Think of it as your mini-dashboard with all the quick essentials ready to be accessed so that you don’t need to reach the main screen. The only issue we noticed is that left-handed users will find trouble to use the right-sided panel, if they plan to use the device for one handed operation. Samsung recognized a number of important areas where its 2014 flagship cameraphones didn't cut it. We're pleased with how the company has handled launching the camera - S Voice often goes unused and taking over its shortcut was a great idea, while optimizing the camera startup time was an even better one. Revolution or gimmick? The Edge is certainly more the former than the latter and kudos to Samsung for pushing a concept to production. Like the YotaPhone 2’s electronic ink rear panel, the Edge’s side screen is one of those ideas that makes you wonder why nobody has tried it before. From the shortcuts panel to improved controls for the camera and video player to turning your phone into a bedside clock radio, the side display has a decent range of uses and a shed-load of potential. Sporting most of the same features as the Samsung Galaxy Note 4, with the addition of that funky curved-edge display, it’s hard to criticise the Edge, given that the Note 4 is our firm favourite when it comes to phablets right now. Many may view the Note Edge as a proof of concept, but it's a very impressive handset. Featuring all the perks of its sibling, the Galaxy Note 4, combined with a productivity-focused curved screen, the Note Edge offers great performance, display and rear camera. However, with prices starting at £700 the perks come at a premium. Add to this the average battery life and Google's previous-generation Kitkat OS, and the Note Edge falls just short of V3's hallowed five-star rating. The Galaxy Note Edge is merely an experiment. I understand why Samsung would put the device out in the wild, and it makes sense given the company’s penchant for “trying things out,” but this isn’t an experiment like the Gear VR. It’s a smartphone that you’re supposed to use throughout the day for everything. I would have rather Samsung put its efforts into trying out a subtle-y curved display like the upcoming LG G Flex 2, which I impressed me the minute I laid eyes on it at CES (mind you, I wasn’t a big fan of the first generation G Flex either). 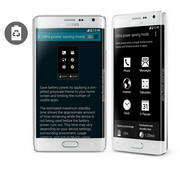 Hopefully we’ll see something like that from Samsung at Mobile World Congress in Barcelona. All of this means you might want to think very carefully before spending an enormous amount of money on what is essentially a first-generation experimental product. The Galaxy Note Edge is undoubtedly one of the coolest-looking phones of its generation, and if that's the only thing that matters to you, then by all means, go ahead and buy it. If not, you can get pretty much all the same benefits and also save a ton of money by going with the woefully one-dimensional though still excellent Galaxy Note 4. The Note Edge's curved display felt like a gimmick at first, but then I started to really appreciate having quick access to all my favorite apps, as well more room for content in apps like the Video player. I just wish there were more panel apps available, which will come with time. But it's not just about developers. Samsung should do more to take this entire concept to the next level. Samsung has made an incredibly ambitious phablet with the Galaxy Note Edge that offers a unique, if unessential secondary screen that handily works well at times. It’s a solid phone, and its software smarts give you plenty of useful options - but it’s just incredibly pricey and absolutely massive, which may put off a few users. If this is the future of phones though, Samsung’s leading the way. 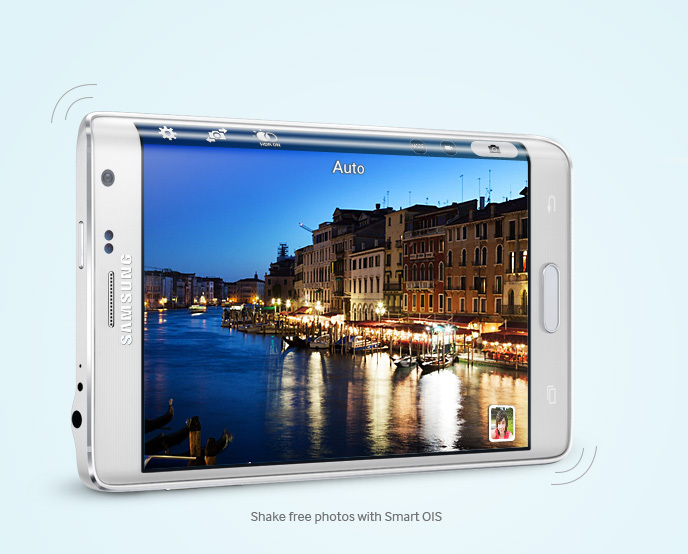 Many key aspects of the Note Edge are the exact same as the Note 4. You get the same Snapdragon 805 SoC, which is a performance powerhouse that tops most of our benchmark charts. You get the same 16-megapixel optically-stabilized camera, which delivers excellent photo quality in most situations. You also get the fantastic S Pen, and a high quality, high density display. 90% Samsung Galaxy Note Edge Review: Is it better than the Note 4? In the end we give Samsung an ‘A’ for effort. It’s refreshing to see a phone that not only tries something new while pushing the technological limits of smartphones forward, but the Edge display still doesn’t feel like a must-have feature. As it stands, it is more novelty than game changer, but if you are set on the Note 4 and don’t mind spending the extra cash there is no reason not to consider the Note Edge. Ultimately though, if you’re looking for an Android-based phablet with a unique extra, the Note Edge fits the bill very nicely (so long as you’re on AT&T, of course). For the majority, the Note 4 or Nexus 6 may make more sense. And if you’re fond of iOS, the iPhone 6 Plus is where its at. The Note Edge is also reminiscent of the original Note from Samsung. When it launched, we collectively said “really, Samsung? Really?” in response to their big screen. Now, everyone is following suit (even Google! 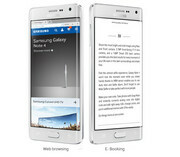 ), and websites everywhere are considering the Note 4 for their year-end “device of the year” articles. The only question now is if you’re an early adopter. If you are, give the Note Edge a good, hard look when you want a new phone. I think you’ll be impressed by all the subtle, cool things it can do. I know I was. This device will cost you between $399.99 and $429.99 with a two-year contract depending on the carrier you pick it up on. Since you're not necessarily going to pick this device up on-contract - that's the cool way to go these days - you'll be paying a cool $839.99 to $945.99 off-contract - or through payments, final cost in the end. Probably not. The Note Edge is a strange phone to sum up. We loved the Note 4, but for all their similarities the Note Edge doesn’t deliver. We struggled to find a real use for the curved edge. Maybe one day it will have more compelling uses and we appreciate Samsung trying something different, but it's not there yet. The Samsung Galaxy Note Edge is certainly a spectacle that will turn heads, and while we still can't see it taking off as the next big thing in terms of volume sales, it's a mighty fine modification of the Galaxy Note 4. We thought the Edge would be the benchmark of nonsense, but instead it's a benchmark in forward-thinking; a smartphone experience on the edge of excellence. The biggest barrier for the Samsung Galaxy Note Edge is that it’s one of the most expensive handsets on the market right now, especially if you want it free on a contract, but it’s a device that needs to exist whether you think it makes sense or not. This is clearly a device aimed at early adopters. If you want to sit on the bleeding edge of mobile technology, and money isn't an object, then ... bon appetit. Pricing aside, the Edge is one of the best smartphones you can buy – arguably the best. For everyone else, though, we recommend waiting until Samsung (perhaps) incorporates the Edge Display into the Galaxy Note 5, 6 or 7. Right now it's a cool concept that, for most shoppers, won't justify its markup over the also excellent Note 4. While it is something of a gimmick, we like the Note Edge, though we’re not really sure why. There’s really no reason to have a curved display like it in a phone, and in some instances, it makes using the phone downright difficult. For instance, you’ll have to re-learn how to hold the phone when in camera mode, as it’s kind of comfortable one way, and plain weird the other, as the screen slopes in such a way where it’s hard to hold. You may even get used to pressing the home button often to get away from Samsung’s impossible to switch off Flipboard homescreen, as it mercilessly sends you there if you swipe just barely away from the curve too far to the left. Samsung Galaxy Note Edge Review: Cutting-Edge Curve or Gimmick? Samsung said the Edge screen isn’t a huge power drain, and battery life is comparable to the Galaxy Note 4. I didn’t run a formal battery test, but with moderate to heavy use, the Galaxy Note Edge provided enough power to last a full day. I got more mileage out of the Galaxy Note 4 (it lasted about a day and a half), but it also has a bigger battery. High price pushes the Note Edge into a niche, but that was always where it belonged. Even if curved screens become common in 2015, this is the trailblazer. We’ve had a lot of fun using the Note Edge, with our only serious regret for the thing being that it just doesn’t last quite long enough off a charge to match-up with Samsung’s more ordinary phones. Should you buy it? Probably only if you’re determined to be first and most innovative in your gadget selection. But that doesn’t mean you shouldn’t still admire its boundary bending ways. The Galaxy Note 4 is a fantastic device and one that sets the bar for large screen smartphones. There is indeed added value with the Note Edge additional display, enough to justify the $120 price premium. The edge display is unique and will turn heads. People I have showed it to have all reacted with genuine surprise and interest. Still, overall, the Note Edge is a considerable upgrade over the Note 3 - it comes with a sharper, Quad HD screen, and while your eyes might not be able to tell much of the difference in terms of sharpness, they would appreciate the improved color accuracy. The OIS camera is also a nice step up on the Note Edge, as it captures some of the best shots we’ve seen from a smartphone and does so consistently, while the Note 3 is a bit less capable. Performance wise, the Note Edge has the faster chips, but the performance boost is very slight and most of the gains are offset by the higher-res display. The Samsung Galaxy Note Edge is a sign of things to come. There are several rumours pointing towards a similar curved screen set up on the Galaxy S6, but like the Galaxy Alpha testing out the firm's next metal frame, the Edge looks to be a proof of concept rather than a fully fledged device in its own right. The fact it sports near identical specs to the Note 4 shows Samsung was just keen on getting that second display working, and while it's done a commendable job in implementing the new technology, in its current form it's still a little half baked and overpriced. Some compromises had to be made as the Edge screen affects the grip and makes one-handed use in some cases impossible (the camera is especially tricky). It's safe to say that it's too early for Edge to spawn its own lineup like the Note did, the manufacturing isn't quite there and most users are not ready yet perhaps to commit the extra cash and trade off the proper grip for the additional usability offered by the Note Edge's curved screen. Review: Samsung’s Galaxy Note Edge dares to be different, but does it innovate? The Galaxy Note Edge’s price tag will drop. It will likely drop fairly quickly following the phone’s launch, in fact. Even still, fresh new flagship smartphones for 2015 will be on the horizon by then, and the Note Edge still won’t be a smart buy. Samsung’s curved displays finally have a reason to exist thanks to the Galaxy Note Edge, but unfortunately it’s not yet a good enough reason to buy a phone that includes one. There you have it, almost all of the bad and the good concerning the first QHD monster that broke cover, the LG G3, and the ingenious and unorthodox S Pen-flaunting Samsung Galaxy Note Edge phablet. With its plastic/metal build and intriguing Edge display, S Pen stylus, and Snapdragon 805 in store, the Galaxy Note Edge will probably appeal to those who want to possess the latest and greatest available on the market. On the other hand, the LG G3 is a more “traditional” device, which employs a relatively compact form factor (considering the screen size), powerful hardware, and a set of features, such as Knock On/Knock Code, which make the device rather user-friendly. The Note Edge has an edge in almost everything when compared to the Galaxy S5. It might be less ergonomic in the hand, but that could be expected from a 5.6” phablet. Other than that, it is superior to the S5 in any way that counts, and we are not only talking the Edge side screen, or the extra input method brought on by the S Pen stylus, as you may or may not find these very useful on a daily basis. Now that we've explored the anatomy of the Note Edge and the device it's based on – the Note 4 – in parts, we can finally claim to have something approaching a holistic view of the matter. Unfortunately for the nevertheless appealing Note Edge, when the smoke clears, the Note 4 proves to be the better bet – it's got the more ergonomic body and a noticeably-better battery life. And yes, at $299.99 with a 2-year contract, it's also $100 cheaper than the extravagant Edge (and savings are even bigger when paying full retail). It’s clear that the Samsung Galaxy Note Edge is a niche, limited-edition phone that is a lot about showing off the futuristic-looking curved rim, and all the little things it can do. It’s also not a device for everyone, with an astronomical price of $399.99 on a 2-year contract, or $945.99 off-contract. However, it will be available on all four major US carriers in the middle of November, so it’s not impossible to get either. Samsung Galaxy Note 4 vs Galaxy Note Edge comparison review: Curved screen or not? Apart from some minor differences like storage and battery size, the Galaxy Note 4 and Galaxy Note Edge are separated by the curved screen feature. We don't think it's a gimmick but you need to decide whether it's worth paying an extra £100 for. The Samsung Galaxy Note Edge is certainly a spectacle. But we can't see it taking off as the next big thing. We think it's more about Samsung showing off just how darn clever it is. We'll give the company that, as it did bring a smile to the face, but it's the standard Note 4 that's really stolen the show. While we are impressed with the engineering, after first use we are still struggling to see the long-term end-user benefits of the Samsung Galaxy Edge. This is a phone more focussed on headlines than handset sales, but that doesn’t mean we aren’t clamouring for another play. Bringt es die Konkurrenz um die Ecke? 85% Ein Hauch von Zukunft? Samsung’s flagship Note series features a curved screen. The Samsung Galaxy Note Edge certainly catches the eye and gives an illusion of a borderless device. Users will no longer lose out on notifications due to the always-on function on the curved side of the screen. The frame design is kept similar to current standards at Samsung with the usual button configuration and faux leather back panel. The Android 4.4 KitKat smartphone is packed with a 2.7 GHz quad-core processor, 3 GB RAM and 32 GB internal memory. You can add another 64 GB using a microSD. The high-end specification coupled with the 5.6 inch Quad HD+ Super AMOLED display will certainly satisfy the most advanced users out there. Image taking capability is pretty good with the 16M+ Smart OIS rear camera with Fast AF and a secondary 3.7 MP front facing camera rated at f1.9. 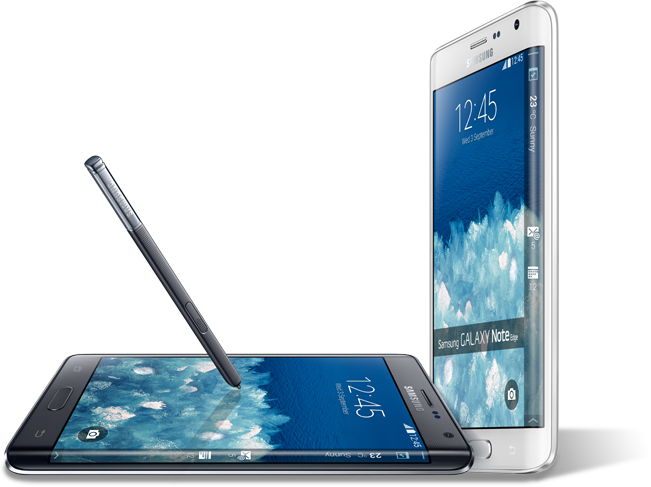 The Samsung Galaxy Note Edge is also equipped with Samsung's famous S Pen technology that allows seamless handwriting and promotes creativity. There is a plethora of new sensors on the smartphone with Hall Sensor, Finger Scanner, UV and HRM being some of the new ones added. Battery life is good with the 3000 mAh fast charging battery powering the device. 85.44%: This is a good rating above average. Nevertheless you should not forget, that 10-15% of all notebook-models get a better rating.